the first render farm in the world with seamless integration into your 3D software. Put 1.000 CPUs on your desktop, in the easiest way and at the most affordable price. Visit our new Renderfarm Homepage www.rebusfarm.net. What's the REBUS Render Farm? 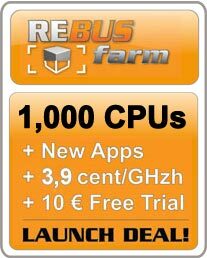 The REBUS Render Farm provides you with 1.000 CPUs right away to render your still-images and animations. No matter which 3D-application you're using: We support them all! Whether you have to meet close deadlines or permanently need a reliable partner for your renderings - our renderfarm service is fast, safe and easy, thanks to our unique technology, the Farminizer Software. We're the only render farm that utilizes a system which seamlessly integrates into your 3D software. Developed by the REBUS Renderfarm the Farminizer Software renders your animation-projects with just a simple click. The Farminizer is an extremely robust piece of software, which has proven it's worth a thousand times in the daily production workflow with 3D Studio Max, Maya, Cinema 4D, MODO, Lightwave and Maxwell. Furthermore the Farminizer Software automatically checks the completeness and compatibility of your data. Expensive mishaps, as they happen with other render farms, are impossible. Incorrect render jobs are a thing of the past! That's our guarantee as the market leader. Also our Render Farm Manager gives you complete control over your costs. Our renderfarm staff manually checks scene-consistency, file-transfers and the rendering process. Visit our new Render Farm Homepage.